I had the awesome opportunity of speaking at the Geektime Conference this month, on a panel talking about whether Israel could become a hub of global fintech. The internet company I founded, eToro has it’s RnD centre here in Tel Aviv as well as a corporate office in London. These are two markets where digital finance is starting to flourish and can become a serious player in their respected nations economies. 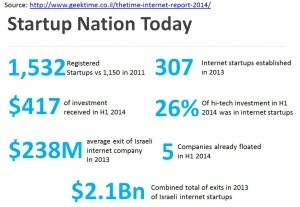 The Tel Aviv tech boom over the past 25 years has been represented by 3 waves of innovation. The 1st, the large software companies such as Magic Software :), Amdocs and Comverse emerged in the 80s. The 2nd wave in the late 90s was represented by the dot.com boom, with hundreds of startup companies emerging and 50 Israeli companies floating on the Nasdaq. Today’s 3rd wave of innovation here in Israel is significantly represented by internet and digital finance in the form of payments, investments, fraud detection and crypto currency startups. Finance is a trillion dollar industry and there is no reason Tel Aviv cannot have a piece of this pie, the same way that London become the world’s banking centre. Financial innovation will be a major disruptor in years to come. As recognised by Google’s Chairman Eric Smidt who met a number of these companies when he visted Tel Aviv earlier in the summer. In order for this growth to be sustained and accelerated governments need to adapt their own regulation and oversights in sync with innovation. For instance I truely believe that Bitcoin will move from a rogue technology to a major financial organ in global economics. Lawmakers need to embrace this. By embracing these trends that will become apart of our future, and having Tel Aviv become a central hub of Bitcoin trading the wider national economy can grow. With it’s innovative culture as highlighted above, Israel is perfectly placde to be a global leader by embracing the essence of Finance 2.0. That’s if it sorts out certain regulatory and industrial obstacles. My blog post from last year on Regulation 2.0 is even more relevant today as it was back then. Snapchat worth 10 Billion USD ... I thought it was crazy at 3.